On the way home this afternoon from running errands, my wife told me about a friend of hers who attended a benefit last night. A local 16 year old has a rare form of Muscular Dystrophy which is almost always fatal. The benefit was for that kid. A bunch of people got together; they freely associated as we Americans do; and put together a fund-raiser to help pay for an extremely expensive experimental therapy. The amount of money raised is not the issue nor is the cause, necessarily. What is at issue is the ability of Americans to band together to make things happen and how the state is superseding this ability at every chance. Whether it is a corporation to make money; or to build a hospital or raise money for good causes, which is one of our great virtues, Americans come together like nowhere else in the world to make things happen. This is one of the reasons we are called the Land of Opportunity. It was one of the fundamental differences between the statist monarchies of France and England and the new republic all the back to our Revolution. And Barack Obama and his allies are doing their best to subvert one of our most glorious achievements. In his Inaugural Address last week, the President, emphasized time and again not the role of the individual, but that of the state in dictating public life. This idea is foreign to our very nature. The freedoms and responsibilities delegated to government, the people, and its secular institutions in the Constitution are being redefined by the Administration and its supporters. And that is the tragedy of the young person my wife spoke of. The American Way is to band together as individuals and do things. The Obama Way is for the state to dictate the outcome and the means to that outcome. In the past this was the way of monarchs, sultans, dictators, and communists. Statism is an outcome concentrating power in the hands of the few. Under the American Way, this kid may have a chance to get the treatment he or she needs. People will work hard and long hours for nothing except the knowledge they did the right thing. Under an Obama, statist system, the bureaucracy will decide who gets treatment and how it is administered. The shocks of Obamacare are already being felt as insurance rates rise and treatment options are circumscribed. Ask anyone in the military covered under Tricare. He’s already tried to sell them out. The voices of the Left are ready to abandon the obese, the smokers, and other “fringe”” dwellers who do not conduct themselves in the politically correct manner. Do you really think that government would authorize millions of dollars in care per patient for a miniscule minority? Under an Obama, statist system bureaucrats decide how big your soft drink is and which cooking oil you use and the school lunches your kids eat. Under an Obama, statist, system, bureaucrats decide how you use your land, how much money you can make, and on a myriad of other vanishing freedoms. Under and Obama, statist system, government reverts to the failed models of the past. The romance with socialism and Marxism or simply enhanced state involvement has been proven wrong in virtually every case in which it has been tried. Western Europe is under crushing debt while the East has only recently seen an economic renaissance after the failure of the Marxist socialist experiment. Russia itself is a mess of a dictatorship. China is authoritarian and still cannot provide for most of its population. And these are the models that Obama’s teachers and advisers ascribe to. Government knows best. The president was absolutely clear in his speech. He outlined his vision of our future. he has a sycophantic media establishment and an intellectually lazy and corrupt political class. He has an agenda. An agenda that is at odds with the American Way. 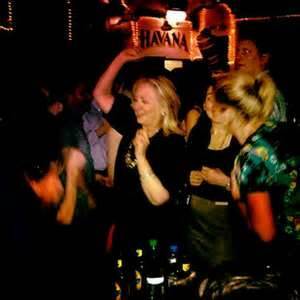 Today we have the spectacle of the Secretary of State emoting on cue while saying nothing of substance regarding the murder of four Americans in Benghazi, Libya on September 11 of last by Islamic terrorists. She is waltzing effortlessly around the greatest deliberative body in the world and making them look like fools. 1 – Where was Ms. Clinton during the attack? Was she a part of the decision making team? Who participated in the decision making team during and after the attack? 2 – Why was this declared as a mob attack when State and the government knew in real-time that it was a terrorist attack? Why did the government continue to propagate this trope for months afterwards? 3 – Why was no effort made to intervene during the 5 hours the attack took place? 4 – Why was every warning regarding the dangers waiting in Benghazi, including pleas by Ambassador Stevens on the very day of the attack, ignored? 5 – Who was responsible for the White House and Department of State descriptions of the attack, and for coordinating the misleading response of the UN Ambassador, the Secretary of State, and the President? 6 – Who was responsible for the decision to tape an apology for the video that purportedly caused the attack that was recorded by Ms. Clinton and broadcast on Pakistani television? who participated in this process? Was this discussed with the President? What was the thought process behind this? Why was the decision made? Why was the decision made when the facts were known to be otherwise? 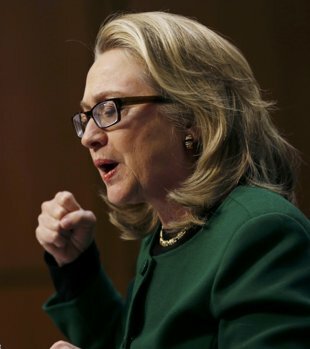 7 – Why was the Department of State caught completely off guard not only in Benghazi, but in Cairo as well? 8 – Why did the Secretary of State continue to insist weeks and even months later that the attack was caused by a protest when she had the facts at hand that stated otherwise? 9 – Why have senior officials of the State Department repeatedly contradicted each other regarding the responsibilities and cost of improving security at State Department run facilities around the world? After four months, there are no answers. The White House, the Intelligence establishment, and the State Department have been playing a game of keepaway with witnesses; have stalled and prevaricated, and danced with their enablers in the media to quash the investigation and its mention in the news. The papers and the Internet and the foreign policy magazines are all now talking about Mali. Once again, there is a war in a country most people couldn’t find on a map. Islamist insurgents, primarily from the Tuareg, a nomadic people, have been declaring jihad against what government exists in one of the harshest terrains in the world. The Sahara and Sahel make Afghanistan look like a summer camp. This is the land of 1,000′ sand dunes and tiny oases, and dusty, remote towns like Timbuktu, the legendary end of the line in 19th Century literature. Beyond Timbuktu there was nothing but endless desert for thousands of miles. The Land of the Tuareg is called Tinariwen and extends from the inner deserts of Libya to those of Niger, Mali, Chad, Algeria, Burkina Faso, and Nigeria.Other tribes are allied with or subject to the Tuareg in these regions. The Tuareg have been in an almost constant state of war and rebellion against first the Western colonial powers, and the national governments in each of the aforementioned countries. Starting in 2006/2008 radical Islamists, including some influenced by Al Qaeda, began to proselytize in Tinariwen. The Tuareg have always been extremely conservative. They are sometimes still involved in the slave trade even now. This is a pre-colonial African society, with some parallels to Afghanistan, I might add. Tinariwen’s is among the driest climates in the world. The oases are life, and control of the oases is political power. While Saudi Arabia has its oil wealth and modern cities Tinariwen has no riches and is largely barren. It is even more tribal and more remote. A united Tinariwen would be larger than any country in Africa, including the formerly united Sudan. The distances are vast and the ability to govern such a large area almost impossible. However, the attack on the gas processing plant in Algeria and rapid collapse of resistance in Mali point to a much larger problem. It isn’t a failed state. It’s a never had a state state. In most countries the effort to relocate and anchor nomadic peoples has been a primary objective. Smuggling, banditry and rebellion are much more prevalent where there are no police or state controls. Virtually every one of the states where the Tuareg live have waged harsh wars of suppression with only limited success ever since their Independence in the 1960’s. Now, with failed and dysfunctional states all around and the power of the word of the Prophet as interpreted by Al Qaeda, along with an infusion of modern weapons from Libya the Tuareg in the West see the opportunity to break away from governments to revert to purely tribal governance. The West sees Al Qaeda training camps in the deep desert but at the same time the desert is the greatest enemy. Water is survival. Control of the oases is power. This is real live French Foreign Legion 1,000′ sand dune desert and hard Sahel scrubland where the nearest water could be 100 miles. the caravans have been plying the same routes for 1,000 years because of the same need for water. While the first reaction of the military may be to bomb and strafe the jihadis it might be better to negotiate with the leaders. The Tuareg councils of elders are ancient and formalized to a far greater degree than in Afghanistan or Iraq with much less corruption. When you have nothing, there is nothing to steal. This is not Lawrence of Arabia or one of Delacroix’s paintings or Afghanistan or any other desert war. It is probably a uniquely unnecessary war if properly handled. Much of the problem is in the actions of corrupt central governments. Even the crisis with Boko Haram in Nigeria is different. The Tuareg are in Nigeria, but they are not of Nigeria. One of the critical mistakes make in Iraq and Afghanistan was simple hubris. We did not and do not have the T.E. Lawrences and Richard Warburtons who know the inhabitants intimately and are accepted by both sides. We seek to impose top down solutions and spend billions of dollars on a constantly revolving and changing set of priorities because it is our way. The conflict in Mali is in its early stages. Let us hope after 11 years of constant warfare that somehow, someone comes to their senses. Expansion of this war will spread from country to country if we do not. There is a perverse truth that has been overlooked in the latest effort by liberal activists and politicians to enact more gun control legislation. Gun sales are through the roof. Dealers are jacking up prices and shelves are emptying. Back orders at gun manufacturers are at all time highs. The threat to ban “assault weapons” has backfired. Instead of finding real solutions, the politicians are the single largest driver of gun and ammunition sales. In the 1980’s when the Brady Bill was passed, millions of firearms were sold in the panic that ensued prior to the ban taking effect.The assault weapons ban in 1994 triggered another round of panic buying. This ban, which was the downfall of the Clinton presidency, lasted 10 years and was largely ineffectual, as the manufacturers simply redesigned their product and continued doing business. 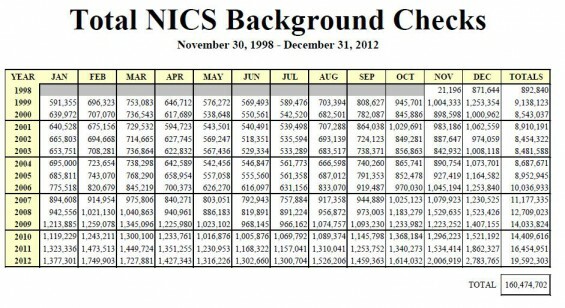 The FBI only began releasing the data on background checks in 1998 , but in that time has not explained how the database is managed in order to ensure that unauthorized purchasers are kept from obtaining firearms. When Fast & Furious is considered there is reason to doubt the system works very well. Over 2,700 firearms were allowed to fall into the hands of the Mexican drug cartels, presumably having undergone FBI background checks. One of the official reports on Fast & Furious stated that the Bureau of Alcohol, Tobacco, and Firearms, who were running the operation, weren’t even keeping track of the firearms purchases. There are some very strong reasons to believe the FBI system doesn’t work well. In California in 2008, the Leftist state legislature, which has its own long-term romantic involvement with gun control, was at it again. The state enacted a ban on .50 cal rifles, ensuring that any inventory remaining would sell out immediately. Again manufacturers adapted and the same firearms became available in other calibers, getting around the law. In the aftermath of the Tucson shooting in 2011 the state enacted AB 962 to end mail orders of ammunition; require fingerprinting of ammunition purchases; and restrict purchases significantly. None of these measures addressed the issue of keeping guns from the mentally ill, but the shooting was an excellent excuse for more gun control. Before the law was overturned by a state judge, there was a massive increase in sales of ammunition in the state, and with it of firearms. Once again demand was driven by fear of the government’s actions. The statistics are there for all to see. It is clear that the it is gun control legislation and government that has been the greatest single driver of gun sales since the 1980’s. Perhaps one day the Left will be willing to discuss the real issues, but it is doubtful. Merts! 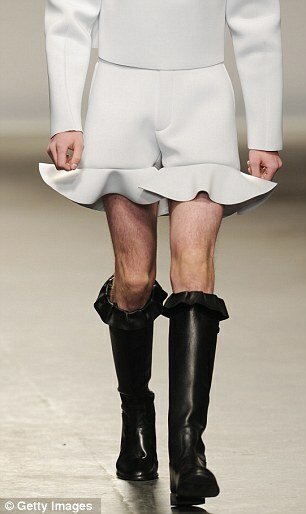 The new men’s fashion fad! The men’s skirt, or Mert, is all the rage in fashion whether in a highland tartan or metallic minis with high heeled fringed jackboots. It recognizes men in touch with their feminine side; perhaps too much so. After the stunning reception on the London runways this week Merts will be seen in heavy evidence on the reviewing stand for the Inauguration. 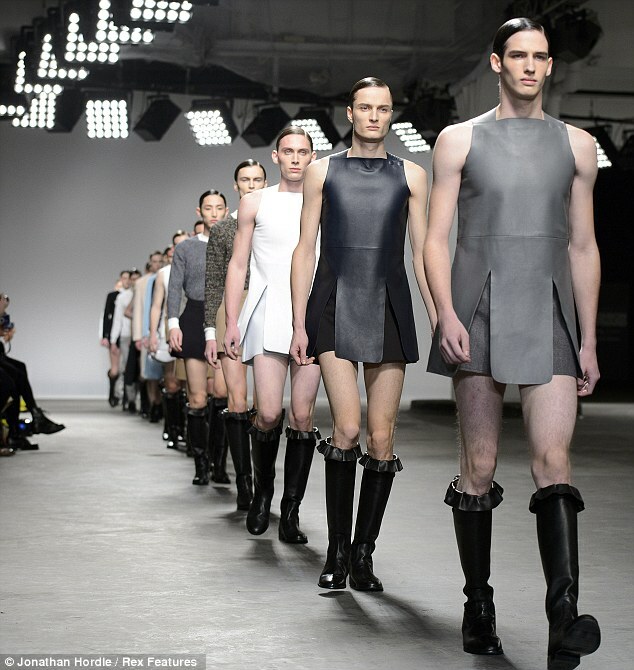 The President has issued an Executive Order for a full dress military version for senior officers, and all male Supreme Court Justices will also be re-equipped with a version 2″ below the knee to protect their dignity. Whether it is the runways of London or the streets of LA, Merts are where it’s at for fashion forward men. 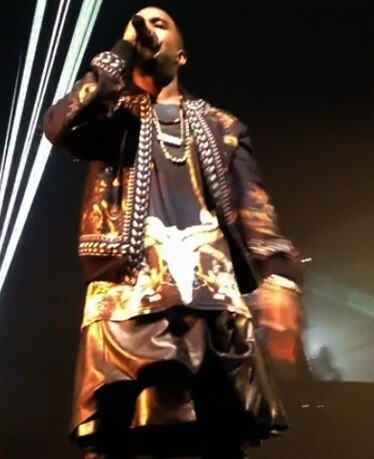 Up on stage, Kanye West has men and women wondering whassup under his kilt as he tops it off with a funky Versace waistcoat. 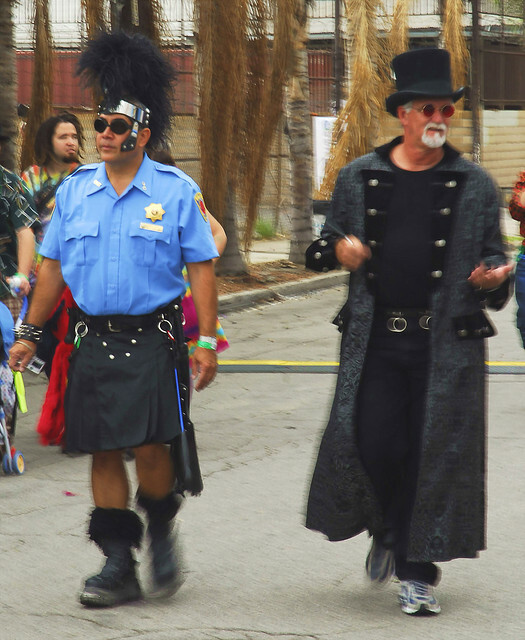 In Los Angeles those wicked spanking patrols at the Burning Man decom were spotted looking for a few good tushes. Fringed or traditional Tartan or leather, the Mert is where it’s at in 2013. Fashion is definitely Forward. and make Gore a very rich man. Even Begly thought Gore was a freak. But the masseuse wasn’t buying and ended up crying that Al was just there to molest. Mr. Gore is just not sincere. When he tells us one thing and he does something else we know that his actions are queer.